Hillsborough/Millstone Municipal Alliance Celebrates Red Ribbon Week! Red Ribbon Week is celebrated in October every year and the campaign supports the continuing tradition of displaying red ribbons as a symbol of intolerance toward the use of drugs and underage drinking. Each year the Township Committee joins with the Municipal Alliance in support of this important awareness campaign by issuing a proclamation, tying red ribbons at the Municipal Complex, supporting the Red Ribbon Football game and providing communication channels for the many activities that the Alliance champions throughout the year. 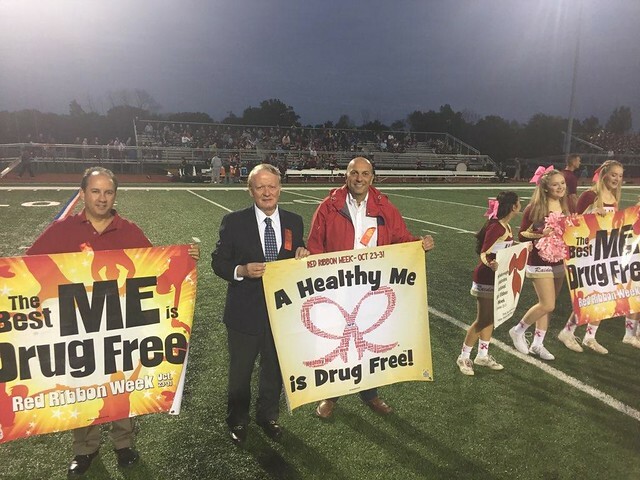 Members of the Hillsborough/Millstone Municipal Alliance celebrated Red Ribbon Week at the Hillsborough High School home football game late last month night. Members of the Alliance were joined by Congressman Leonard Lance, Committeeman Frank DelCore, Committeeman Carl Suraci, students, and the community to celebrate this important event.